Jidenna – Classic Man ft. Roman GianArthur – YouTube. girl you know we go thangs to do. so get your a$$ in the car and COME THRU. 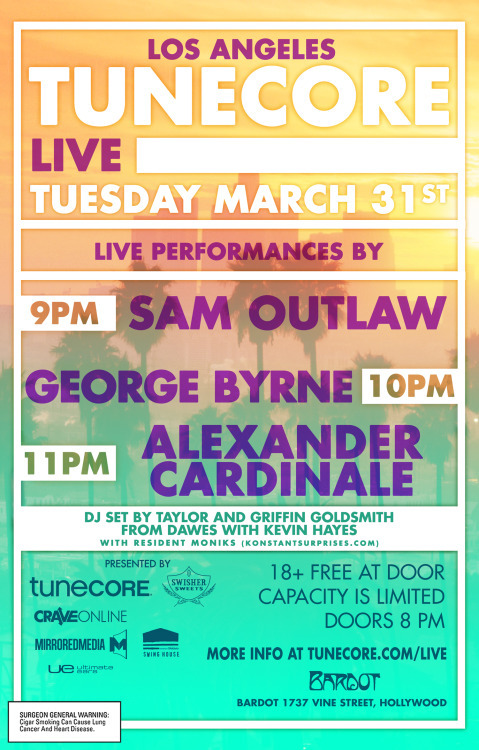 The second event of the TuneCore Live series is tomorrow night Wed 2/25! We have a pretty cool lineup including a DJ set by LA’s HOLYCHILD, and live performances by Knower, Dear Boy (LMU represent), and Waterbed. And I’ll be providing some house music as well! Come by for a fun hang, drinks, some free cigars, and live music. It’s free, doors at 8pm. More info here and below (ft. cool photo by LA artist George Byrne). Konstantsurprises will be dropping some tunes on Wednesday, 1/28’s TuneCore Live launch event, taking place at Bardot in Hollywood on Vine. The night will feature live performances by The Neighbourhood alum Olivver The Kid, as well as SoCal rockers Hudson andNightmare Boy, whose credits you might recognize from Lana Del Rey’s Ultraviolence album. Additionally, the event will feature DJ sets by Tron Stamos and Konstantsurprises. Sample some Swishers Sweets, get an Ultimate Ears mold done, and get your drink and music on with LA’s music industry and your peeps. 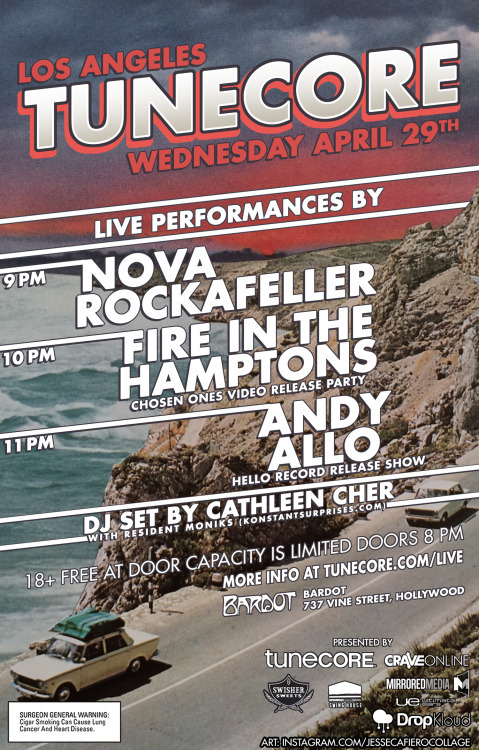 TuneCore Live’s L.A. Kickoff Event To Feature Olivver The Kid, Hudson & Nightmare Boy. The Hood Internet and Rockie Fresh Discuss Their One Of A Kind Collaboration – YouTube. Beats by Dre just IN the game with the big players now; From an acquisition under Apple, to an epic World Cup ad competitive to sports ads from Nike, Adidas, and Gatorade. Taking over and repping as a titan for music brands…. Did Beats by Dre Just Out-Nike Nike With This Incredible World Cup Ad? | Adweek. Hear Kanye West’s Jittery, Abrasive ‘God Level’ | SPIN | Music News.